How To Manually Change Or Fix Extended Monitor Resolution In Ubuntu / Debian? Monitor resolutions and especially extended monitor resolutions can be real pain at times. Although Ubuntu's monitor resolution detection is really smart but at times it can give you a bad day! Working on extended monitor setup is helpful as it saves you time. 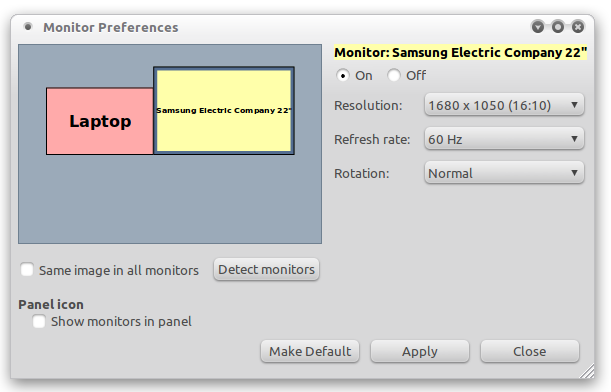 Well, in this article we will show you how you can manually set your monitor resolution in Ubuntu or Debian. Not only this, using the tips provided here you can fix your monitor's resolution when the external monitor is not getting detected properly. We will be using the xrandr utility to achieve the fixes. xrandr is available in all linux distributions like Ubuntu, Fedora, Red Had, Debian as the xrandr command. So you can access this from the command line. Once this is done, you will now have a 1680 by 1050 pixels screen resolution on your system and you can use your Linux distribution's monitor adjustment tool to apply this new screen resolution on your system. However at times, this one step is not enough and we need to perform one more step to apply this resolution on your computer. In your terminal, enter these two commands one by one, in order to apply the new 1680 by 1050 resolution to your extended monitor. What these commands will do is, they will apply the aforementioned screen resolution to your extended monitor. Now one thing you have to take care is if you were applying these fixes to your laptop screen, then you need to replace VGA1 with LVDS1. Please let us know if you face any problems.